Last week I posted four of six postcards from The Farmers Mutual Aid Association of Van Wert County, Ohio, that were sent to my great-grandfather Louis J. Schumm. 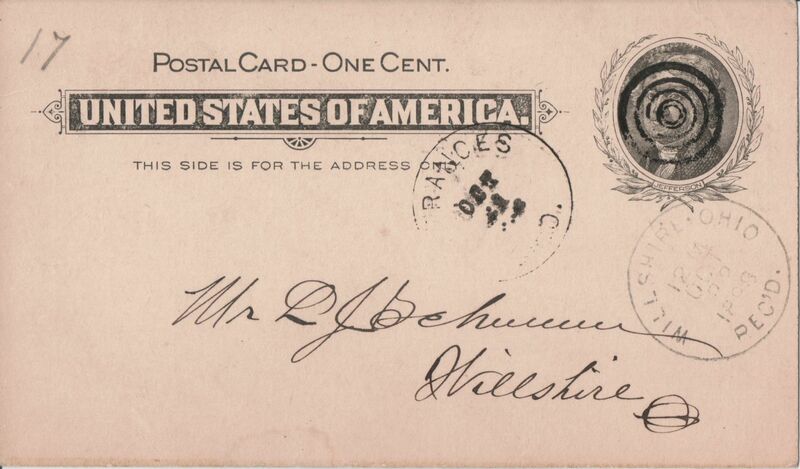 Last week’s postcards were dated from 1889-1893. Today I am posting the other two postcards that Louis had stashed away in an old book. These two are dated 1898 and 1901 and they contain more claimants’ names than the other four postcards. These two were also addressed to my great-grandfather Louis J Schumm, Willshire, Ohio. Farmers Mutual Aid Association assessment to Louis J Schumm, 1898. These two cards contain more information because they contain a lot more names than the other four and these cards tell the reason for the claim. The majority of the claims were due to fire, which was obviously a major hazard at that time. I recognized a couple names and I maybe you will too. Frank P. Dull, of Liberty Tp, Van Wert Co, O, sustained a loss of $455.30 on dwelling house and part of contents by fire, February 14, 1898. Rachel Weimert, of Harrison Tp, Van Wert Co, O, sustained a loss of $467.40 on dwelling house by fire, May 1, 1898. James E. Harshman, of Willshire Tp, Van Wert Co, O, sustained a loss of $705.00 on dwelling house, out buildings and part of their contents by fire, May 1, 1898. Frederick Reed, of Tully Tp, Van Wert Co, O, sustained a loss of $1044.50 on barn and part of contents by fire, May 23, 1898. 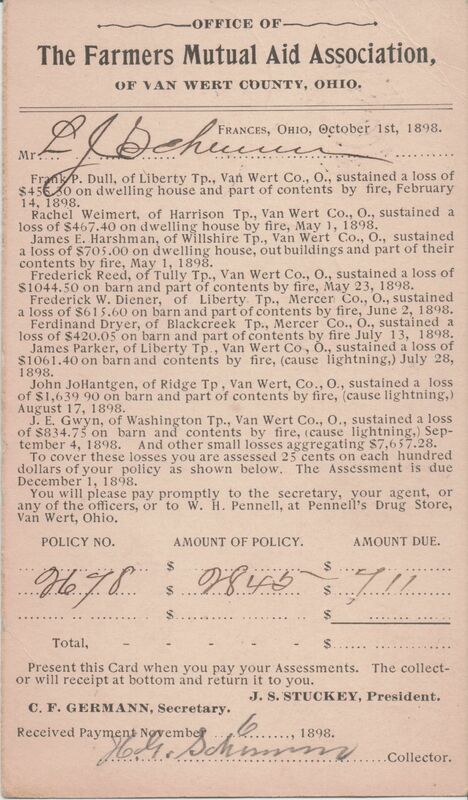 Frederick W. Diener, of Liberty Tp, Mercer Co, O, sustained a loss of $615.60 on barn and part of contents by fire on June 2, 1898. Ferdinand Dryer, of Blackcreek Tp, Mercer Co, O, sustained a loss of $420.05 on barn and part of contents by fire July 13, 1898. James Parker, of Liberty Tp, Van Wert Co, O, sustained a loss of $1061.40 on barn and contents by fire, (cause lightning) July 28, 1898. John JoHantgen of Ridge Tp, Van Wert Co, O, sustained a loss of $1639.90 on barn and part of contents by fire, (cause lightening) August 17, 1898. J.E. Gwyn, of Washington Tp, Van Wert Co, O, sustained a loss of $834.75 on barn and contents by fire, (cause lightning) September 4, 1898. And other small losses aggregating $7657.28. To cover these losses you are assessed 25 cents on each hundred dollars of your policy as shown below. The assessment is due December 1, 1898. You will please pay promptly to the secretary, your agent, or any of the officers, or to W.H. Pennell, at Pennell’s Drug Store, Van Wert, Ohio. Present this card when you pay your Assessments. The collector will receipt at bottom and return it to you. Farmers Mutual Aid Association assessment to Louis J Schumm, Oct 1898. I am not sure if the amount due was really $711 or if they left out the decimal and it should have been $7.11. Compared to what he was assessed in the past, which was just a few dollars or less than a dollar, $711 would have been a lot of money! That would have been a big assessment increase, although there were a lot of claims that year and the assessment was a little higher, at $.25/$100. Someone probably left out the decimal because, according to my math, the claims would have been over $284,000 if the assessment was $711. A lot of money back then and a lot of money today! Office of The Farmers Mutual Aid Association of Van Wert County, Ohio. You will take notice that: Geo. Long, of Ridge Tp, sustained a loss of $373.55 on barn & contents by fire, Feb. 2, 1901. Flora B. Johnson, of Dublin Tp, Mercer Co, sustained a loss of $543.75 on dwelling house and part of contents by fire, Feb. 19, 1901. 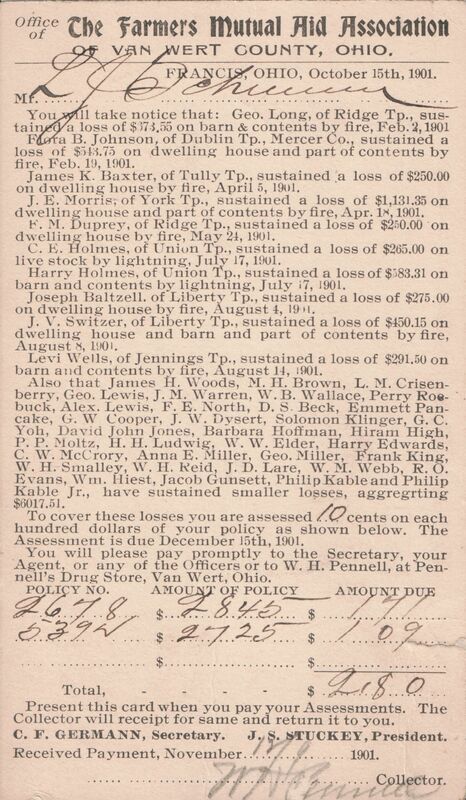 James K. Baxter, of Tully Tp, sustained a loss of $250.00 on dwelling house by fire, April 5, 1901. J.E. Morris, of York Tp, sustained a loss of $1131.35 on dwelling house and part of contents by fire, April 18, 1901. F.M. Duprey, of Ridge Tp, sustained a loss of $250.00 on dwelling house by fire, May 24, 1901. C.E. Holmes, of Union Tp, sustained a loss of $265.00 on live stock by lightning, July 17, 1901. Harry Holmes, of Union Tp, sustained a loss of $583.31 on barn and contents by lightning, July 17, 1901. 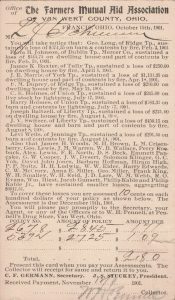 Joseph Baltzell, of Liberty Tp, sustained a loss of $275.00 on dwelling house by fire, August 4, 1901. J.V. 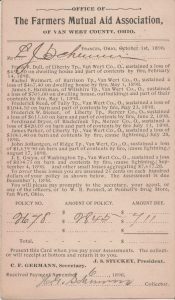 Switzer, of Liberty Tp, sustained a loss of $450.15 on dwelling house and barn and part of contents by fire, August 8, 1901. Levi Wells, of Jennings Tp, sustained a loss of $291.50 on barn and contents by fire, August 14, 1901. Also that James H. Woods, M.H. Brown, L.M. Crisenberry, Geo. Lewis, J.M. Warren, W.B. Wallace, Perry Roebuck, Alex Lewis, F.E. North, D.S. Beck, Emmett Pancake, G.W. Cooper, J.W. 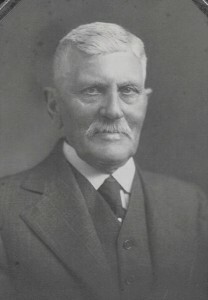 Dysert, Solomon Klinger, G.C. Yoh, David John Jones, Barbara Hoffman, Hiram High, P.P. Moltz, H.H. Ludwig, W.W. Elder, Harry Edwards, C.W. McCrory, Anna E. Miller, Geo, Miller, Frank King, W.H. Smalley, WH. Reid, J.D. Lare, W.M. Webb, R.O Evans, Wm. Hiest, Jacob Gunsett, Philip Kable, and Philip Kable Jr., have sustained smaller losses, aggregating $6017.51. To cover theses losses you are assessed 10 cents on each hundred dollars of your policy as shown below. The Assessment is due December 15th, 1901. You will please pay promptly to the Secretary, your Agent, or any of the Officers or to W.H. Pennell, at Pennell’s Drug Store, Van Wert, Ohio. Policy No. 2678, Amount of Policy $2845, Amount Due $1.71. Policy No. 5372, Amount of Policy $2725, Amount Due $1.09. Present this card when you pay your Assessments. The Collector will receipt for same and return it to you. C.F. 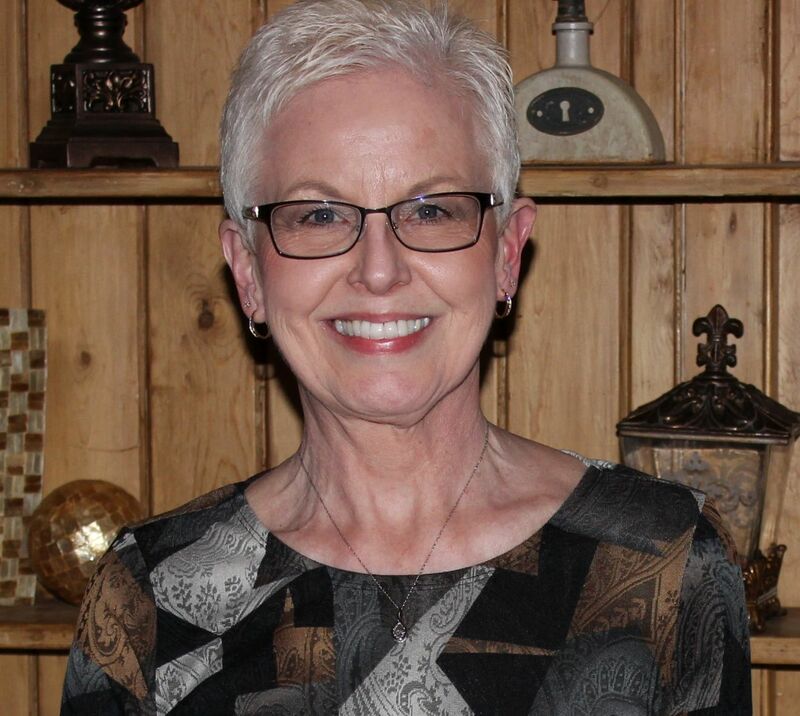 Germann, Secretary, J.S. Stuckey, President. Farmers Mutual Aid Association assessment to Louis J Schumm, Oct 1901. Interesting information and interesting to get a glimpse of some things that happened to our ancestors and when they happened. Hi Karen! On the 1898 postcard, the “Frank P. Dull” is Franklin Pierce Dull, born January 31,1855, the younger brother of my Great-Great Grandfather, James Monroe Dull (born January 23, 1846). There were 13 children in this generation of the Dull clan, including two who died at childbirth. An interesting footnote is that the first five boys of this generation of the family were named after United States presidents, while the last two were not. I wonder if the elder Dulls ran out of presidents that that admired? So interesting that you have a family connection there! It sounds like they were a very patriotic family. Thanks for writing!